Elk Grove Village – FMI Medical Silicone Molding, a firm that specializes in ultra-clean molding of silicone parts for medical devices, has achieved energy savings and reduced waste in its operations in 2014, netting approximately $18,000 in electric usage savings in one year. FMI conducted engineering studies and investigated advanced technology to reduce electric usage while maintaining its rigorous standards for cleanroom operations, which require cool temperatures, highly filtered airflows and bright lighting. FMI invested in new Energy Star equipment, including a variable-speed air compressor used in manufacturing operations, a high-efficiency chiller that replaced two older chillers, and two variable-speed supply fans that run based on demand. In lighting upgrades, FMI replaced all 40-watt bulbs with more efficient 32-watt bulbs in 89 light fixtures. In the molding department, the firm upgraded the ballasts and replaced fluorescent bulbs with 15-watt LED bulbs in 44 light fixtures. The new LED bulbs are guaranteed to last for 10 years, which also reduces maintenance and replacement bulbs. The new compressor, fans and lighting upgrades qualified for Smart Ideas incentives from electricity provider ComEd. In a move to reduce waste, FMI replaced disposable shoe covers with cleanroom compatible shoes, which required developing new procedures for staff entering the cleanroom and validation of the new program over a two-year period. The program will eliminate some 20,000 shoe covers from landfills each year. "Our green initiatives are important not only for our business to run more efficiently, but for our clients in the medical device industry who share our concern for the environment, as well as for our community," said Frank Sullivan, president of FMI. "These steps are just the beginning, as we will continue to look for ways to reduce waste and conserve energy in our operations." FMI is a leading supplier of medical-grade silicone components designed primarily for use in implantable Class II and Class III medical devices. Since 1989 FMI has been helping medical device manufacturers develop new products and expand their global market reach. 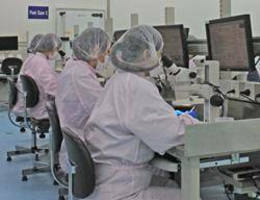 FMI operates cleanroom facilities near the Chicago O’Hare International Airport and in Suzhou, China. Both facilities are ISO 13485-certified for medical devices with Class 5, 6 and 7 cleanrooms in the US and Class 7 cleanrooms in China. FMI is a wholly owned subsidiary of Flexan Corporation, which began operations in 1946 in Chicago and also has a facility in Suzhou, China, which opened in 2004.